Sandakfu or Sandakphu at 3780 mts. / 12,400 ft is the highest peak in West Bengal, located at the edge of the Singalila National Park in Darjeeling district on the West Bengal-Sikkim border. Sandakphu literally means ‘The height of poison plants’ and this name is probably acquired from the belief that the peak is packed with poison plants. It is also the highest point of the Singalila Ridge. Trekkers swear that the best view of Kanchenjunga is from Sandakfu. From the summit you can see four of the five highest peaks in the world, Everest, Kanchendzonga, Lhotse and Makalu. If adventure holiday is more of your thing, going on a trek at Sandakphu is definitely the kind of activity you'd enjoy on your honeymoon. 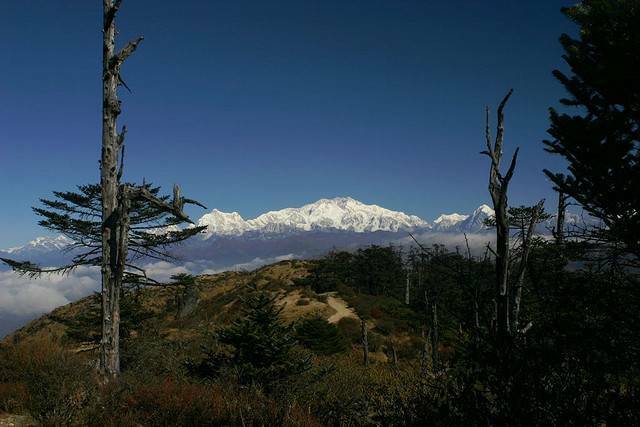 Perched at an altitude of 11,930 ft, Sandakphu is one of the most beautiful trekking destinations in the world. Located about 50 kms from Darjeeling, the trek to Sandakphu (highest peak in Singalila ranges) is a truly unique and romantic experience. Meandering through blooming rhododendron trees, fragrant orchids and magnolia and the snow-capped mountains of the Himalayan ranges providing the ultimate backdrop, the trek is a feast for senses. Darjeeling has several accommodation options, Glenburn Tea Estate, Windamere Hotel, Sinclairs, Mayfair, Elgin and Central Heritage are a few romantic options. Sandakphu can be reached by car or you can trek to the top. Going with YHAI is one of the best options to trek this unexplored destination. As the trek is quite tough, children and people with respiratory problems should avoid it. Best time to visit is early morning, when skies are most likely to be clear.